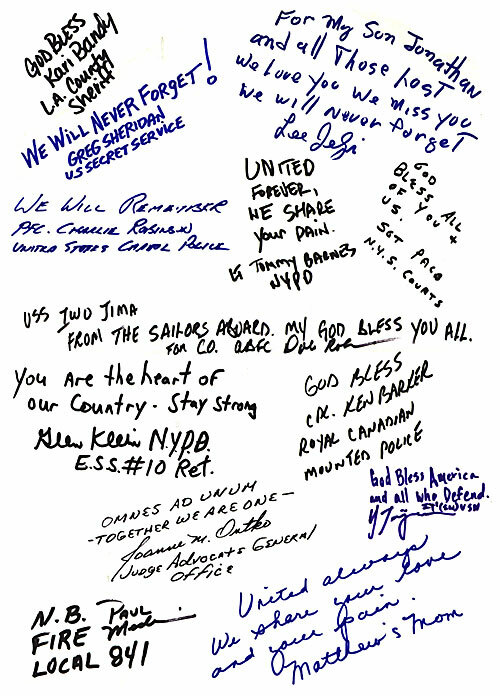 Signed in solidarity by rescue and recovery from Ground Zero, sailors and marines defending our country, civilians, police officers and firefighters, the United in Spirit artwork is a remarkable tribute. SEE DETAILS OF WHAT WAS WRITTEN. 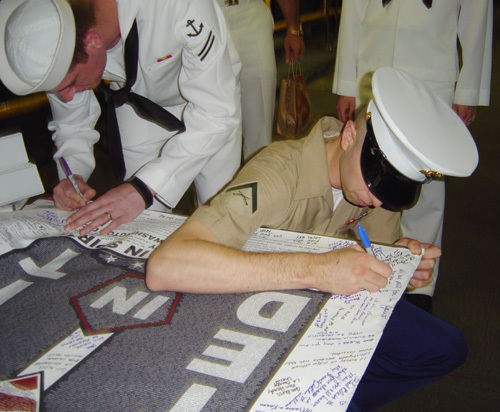 Sailors and Marines on the USS IWO JIMA sign the Oklahoma City banner for the National Memorial Institute for the Prevention of Terrorism. See pictures. On the 9th Anniversary, again ArtAID collaborated with September's Mission to provide a remarkable artwork honoring all those lost on September 11th and on April 19th in Oklahoma City, whose names of the 168 victims are represented in "our heart" surrounded by the towers of the World Trade Center and the shape of the Pentagon where those names are also listed. ArtAID members may download the original print HERE. 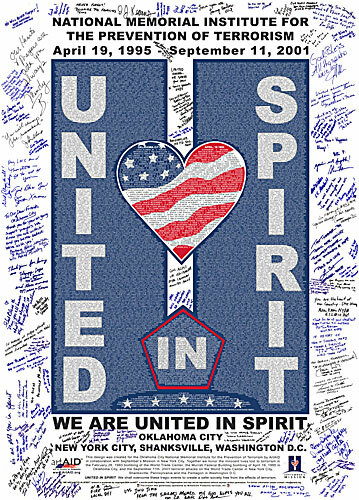 An inspiring testament of solidarity from around the country, ArtAID presents the National Memorial Institute for the Prevention of Terrorism prints of the signed artwork. 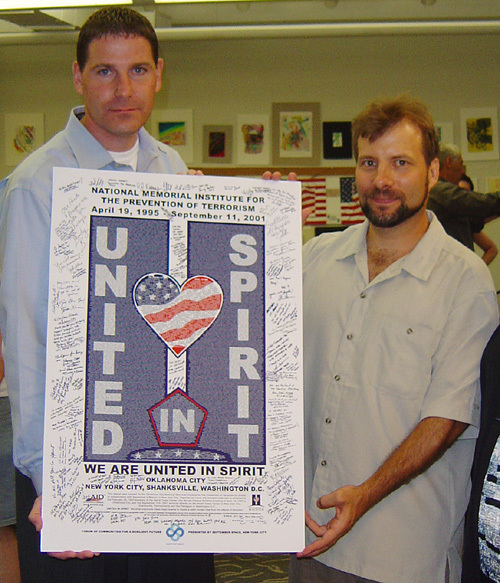 Ken Thompson of the National Memorial Institute for the Prevention of Terrorism receives prints of the "United In Spirit" artwork. The Oklahoma City Families of the 168 men women and children who died in the April 19th, 1995 bombing of the Alfred P. Murrah Federal Building, made an immediate outreach and connection to the World Trade Center Families. They experienced the WTC loss with a profound sympathy made all the more sincere in their personal losses in Oklahoma City. Shortly after September 11th, 2001, in collaboration with September's Mission, ArtAID created this beautiful tribute to thank Oklahoma City for the immediate response in aid and solidarity. This "sister city" experienced first hand the effects of a massive terrorist strike and loss of life. For everyone effected by the tragedy who wish to have this image, it is free to download for personal use and may be printed by anyone with a computer and desktop printer. You are encouraged to print and share this image with others. No one is permitted to resell this image without permission. ArtAID does not seek to profit of this tragedy, nor should anyone else!